(Nanowerk News) Florida Atlantic University’s Charles E. Schmidt College of Science and the Division of Research will present the 2010 Nobel Laureate Lecture on Friday, February 26 from 4-5:30 p.m. in the Libby and Harry Dodson Auditorium in the Christine E. Lynn College of Nursing. Professor Sir Harold “Harry” Kroto, Ph.D. is the 1996 recipient of the Nobel Prize for Chemistry and the Francis Eppes Professor, department of chemistry and biochemistry at Florida State University and an advisory board member of FAU’s department of chemistry and biochemistry. As chemistry and physics at one borderline and chemistry and biology at the other begin to become indistinguishable, multidisciplinary research is leading to the fascinating “new” overarching field of nanoscience and nanotechnology. Titled “Architecture in Nanospace,” in his lecture, Kroto will discuss how ingenious strategies for the creation of molecules with exactly specified structures and functions are being developed; in essence, molecules that “do things” are now being made. His Nobel Prize was based on his co-discovery of buckminsterfullerene, an unusual carbon molecule consisting of 60 carbon atoms arranged as a spheroid, in a pattern exactly matching the stitching on soccer balls. As the geodesic domes designed by the late inventor/architect Buckminster Fuller were crucial in arriving at the correct structure at the time of the discovery, Kroto named the molecule "buckminsterfull erene" – now nicknamed "buckyball." Its discovery has opened up an entirely new branch of chemistry and the family of “Fullerene” carbon cage molecules have exceptional structural stability, electronic behavior and other intriguing properties which are now finding applications in solar cell and medical applications such as non-toxic Magnetic Resonance Imaging (MRI) agents. 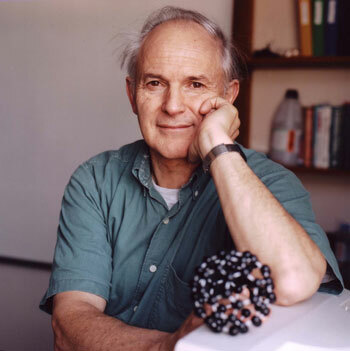 Professor Sir Harold “Harry” Kroto, Ph.D., 1996 recipient of the Nobel Prize in Chemistry. These new approaches in nanoscience and nanotechnology are leading to novel advanced materials exhibiting functional behavior with novel applications. Fascinating fundamental insights into formation mechanisms have been revealed and nanoscale devices, which parallel devices in standard macroscopic engineered devices, are now being created. On the horizon are possible applications ranging from civil engineering to advanced molecular electronics which promise to transform the socio-economics of everyday life. These fundamental advances suggest that supercomputers in our pockets (as well as our heads) and buildings which can withstand powerful hurricanes and earthquakes are possible. Faculty members and graduate students in FAU’s department of chemistry & biochemistry focus on chemical biology with interdisciplinary research collaborations across biology, biomedical science and engineering, as well FAU’s Harbor Branch Oceanographic Institute and nearby Scripps and Torrey Pines Institute for Molecular Studies. “Multidiscliplinary research shapes science today, and Professor Kroto’s work is a great example of what thinking across the disciplines can accomplish,” said Dr. Ramaswamy Narayanan, professor and chair of chemistry and biochemistry in FAU’s Charles E. Schmidt College of Science, assistant vice president for research, and chair of the 2010 Nobel Laureate Lecture. The 2010 Nobel Laureate Lecture is open to the public, and there is no charge to attend. Space is limited, and reservations are required. To reserve a seat or for more information, call 561-297-0777 or visit www.fau.edu/research. The Libby and Harry Dodson Auditorium in the Christine E. Lynn College of Nursing is located at 777 Glades Road in Boca Raton. Sponsors of the 2010 Nobel Laureate Lecture include Pirtle Construction Company, the Charles E. Schmidt College of Science, FAU’s Division of Research, and the department of computer and electrical engineering and computer science in FAU’s College of Engineering and Computer Science.